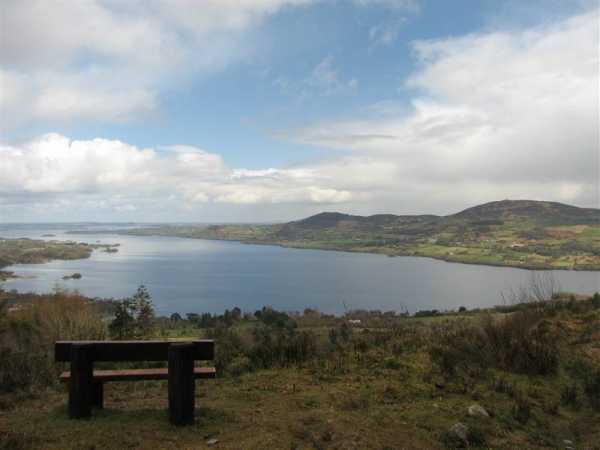 Picture from murraynolan : A bench with a view. Ballycuggaran Wood en route to Moylussa. Picture: A bench with a view. Ballycuggaran Wood en route to Moylussa. I enjoyed a grand walk up Moylussa on the 7th of April. It was a true spring day with some light showers and warm spells of sunshine. While the middle section of the walk is through fairly standard Coillte forest the views before and after this section are enjoyable. Following the advice on these pages as well as a fine article in the Irish Times (search for Irish TImes Moylussa and you should find it) describing the walk to the top, I parked in Ballycuggarran wood and followed the East Clare Way to the fire break before tackling the boggy bog and enventual trail to the top. I returned along the same path. The boggy bog described elsewhere was indeed boggy but not extremely so this time around.